A variable frequency drives (VFD) is a system for controlling the rotational speed of an alternating current (AC) electric motor by controlling the frequency of the electrical power supplied to the motor. Variable-frequency drives are also known as adjustable-frequency drives (AFD), variable speed drives (VSD), AC drives, microdrives or inverter drives. Since the voltage is varied along with frequency, these are sometimes also called VVVF (variable voltage variable frequency) drives. All VFDs use their output devices (IGBTs, transistors, thyristors) only as switches, turning them only on or off. 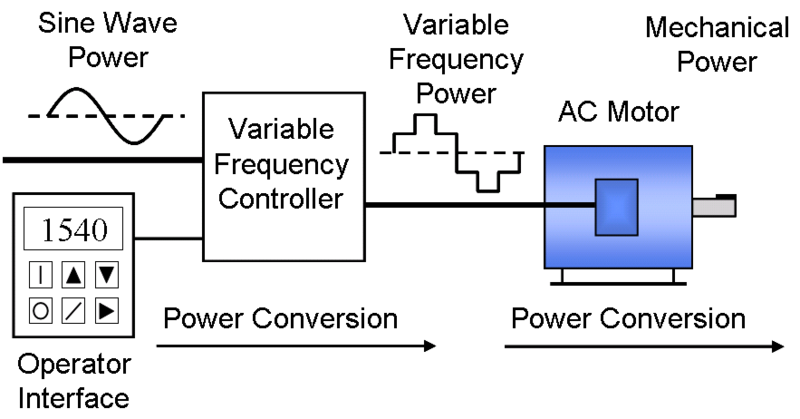 Using a linear device such as a transistor in its linear mode is impractical for a VFD drive, since the power dissipated in the drive devices would be about as much as the power delivered to the load. The most common type of packaged VF drive is the constant-voltage type, using pulse width modulation to control both the frequency and effective voltage applied to the motor load. The motor used in a VFD system is usually a three-phase induction motor. Some types of single-phase motors can be used, but three-phase motors are usually preferred. Various types of synchronous motors offer advantages in some situations, but induction motors are suitable for most purposes and are generally the most economical choice. Motors that are designed for fixed-speed operation are often used. Certain enhancements to the standard motor designs offer higher reliability and better VFD performance. Variable frequency drive controllers are solid state electronic power conversion devices. 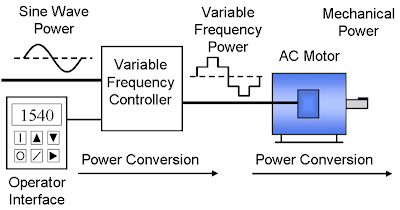 The usual design first converts AC input power to DC intermediate power using a rectifier or converter bridge. The rectifier is usually a three-phase, full-wave-diode bridge. The DC intermediate power is then converted to quasi-sinusoidal AC power using an inverter switching circuit. The inverter circuit is probably the most important section of the VFD, changing DC energy into three channels of AC energy that can be used by an AC motor. These units provide improved power factor, less harmonic distortion, and low sensitivity to the incoming phase sequencing than older phase controlled converter VFD's. When an induction motor is connected to a full voltage supply, it draws several times (up to about 6 times) its rated current. As the load accelerates, the available torque usually drops a little and then rises to a peak while the current remains very high until the motor approaches full speed. By contrast, when a VFD starts a motor, it initially applies a low frequency and voltage to the motor. The starting frequency is typically 2 Hz or less. Thus starting at such a low frequency avoids the high inrush current that occurs when a motor is started by simply applying the utility (mains) voltage by turning on a switch. After the start of the VFD, the applied frequency and voltage are increased at a controlled rate or ramped up to accelerate the load without drawing excessive current. This starting method typically allows a motor to develop 150% of its rated torque while the VFD is drawing less than 50% of its rated current from the mains in the low speed range. A VFD can be adjusted to produce a steady 150% starting torque from standstill right up to full speed.